If time flies when you’re having fun, it travels at warp speed when you’re having fun in a gorgeous luxury resort like The Ritz-Carlton, Lake Tahoe. Perhaps it’s the curiously invigorating-yet-exhausting effect of the elevation (the hotel sits at over 6000 feet above sea level). Yet, it feels like, no sooner have you stepped on the slopes, then it's time to return to the hotel for a massage. No sooner have you slipped into the eucalyptus steam room afterwards do house-made marshmallow s’mores beckon from the fire pit; after which champagne and raw bar top off an unbeatable hour of après ski before what promises to be a memorable dinner, nightcap, and what feels like an early bedtime but is really late evening ("already?"). Time seems to suspend in this memorable destination set among pine trees and a winter snowfall so bountiful, meteorologists have difficulty measuring it (which also extended the ski season an extra week into spring). And yet the hours also slip away—each experience during a well-curated mountain resort day is just as intense as it is fleeting. 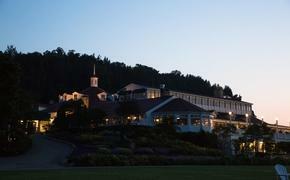 The hotel has a mid-mountain location, with ski-in/ski-out access to Northstar California. The luxury extends right to the slopes: It’s not even necessary to carry your own skis. Just drop your shoes off with the Mountain Concierge, who replaces them with your ski boots, either brought with you or rented on-site. Your skis are already on the rack outside, which are swiftly found and set up by the attendant. It’s easy to get used to. 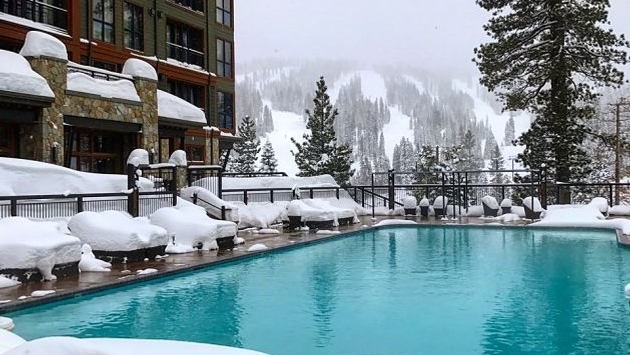 Whether the day calls for skiing, snowboarding, ice skating at Northstar Village (just a short gondola ride downslope), snowshoeing or sledding on an inner tube, the hotel understandably does après ski in an unbeatable way. Weather-permitting, sweet-toothed guests line up at the main fire pit in the afternoon to make s’mores, either with a traditional marshmallow or one of the hotel’s house-made flavors of the day—maple brown sugar the day I went—complete with staff ready to sandwich your marshmallow for you fresh from the fire. If that’s not luxe enough, a roving cart with Moët & Chandon Champagnes, (served traditionally or over ice), with a sumptuous raw bar (including crab claws) caps off the afternoon in the well-patronized Living Room. It surrounds a multi-story stone fireplace with views of the slopes and an extensive menu of soul-warming tipples, including adult hot chocolate and boozy coffees. There’s no shortage of dining in the resort village or on the mountain itself, but there’s plenty on offer right in the hotel. The hotel’s signature restaurant, Manzanita, is designed in an exposed-wood lodge style with a distinct heritage feel despite the entire hotel being a new build. Three meals a day and late night nibbles are dependable and expertly presented. Special requests to mix-and-match menu features (like adding truffle hollandaise to an eggs benedict) are met with signature Ritz-Carlton affirmations; the tomahawk style pork chop and lamb shank are quick menu favorites. Other dining options include grab-and-go items and coffee at Café Blue (if you haven’t drunk enough from the Nespresso machines in each guest room) and the Backyard Bar & BBQ. The latter is outdoors, near the heated year-round pool, and offers sumptuously smoked meats which are peculiarly satisfying—owing again either to the elevation or the effects of a day in the sun on the slopes. Unwinding after a day of hard snow pack on the joints requires a visit to the spa, and this is where the hotel departs a bit from the nor: The spa facilities are open to all hotel guests, regardless of whether they’ve booked a treatment. If a spa experience with whirlpool, steam, and sauna is more your idea of a post-ski afternoon, that’s available, although it would certainly be a shame not to take advantage of the healthy menu of treatments. They are designed to melt away the stress of travel to the resort and/or to relax the muscles after a long day of alpine activities. The spa has its own adults-only outdoor heated pool, although the main pool and whirlpools have to be experienced if only for their views of the ski slopes. Guest rooms are done in the by-now familiar and cozy California lodge style, with thoughtful touches like coat hooks by the guest room door. The rooms are warmed by push-button fireplaces which can be enjoyed from a pair of leather club chairs at the foot of the bed, and have all the expected trimmings one might expect from Ritz-Carlton: From cozy bathrooms and Asprey amenities, to a deep soaker tub and separate rainforest-style shower that’s difficult to get out of (figuratively, of course). READ MORE Are these the Best Hotel Rewards You're Not Earning? The Takeaway: With days flying by at lightning speed, the best advice I can share is to stay as long as possible at this gorgeous mountain retreat. The Damage: Rooms from $249 in spring and autumn shoulders; $349 in summer and winter peak; suites from $499. Good To Know: It seems like a pittance given the luxury room rates, but the hotel does add a $30 per night resort fee. The fee does not include valet parking, (there’s no self-parking). So if you’re arriving by air and looking to spend your entire time at the resort, it may be worthwhile to purchase transfers instead of renting a car. Travel, accommodations, meals and activities were furnished by The Ritz-Carlton Lake Tahoe and Northstar California in preparation for this story.